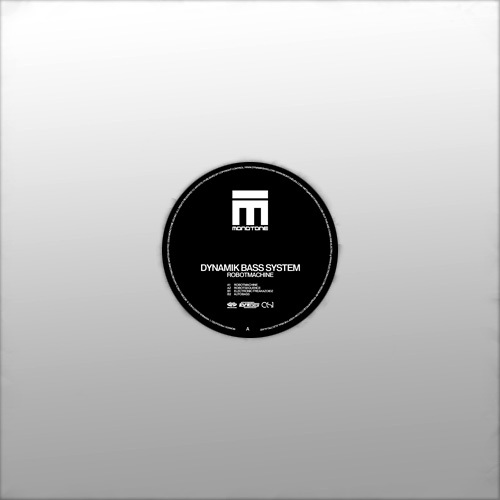 Dynamik Bass System confesses that this release contains enough sub-bass to damage your speakers. And if you follow electro productions of this band formed by its leader T. Werner associated with his fellow partners S. Gezgin and Dj FRZ, you’ll probably not be surprised by the warning. Author of a succinct but vital discography on labels such like International Deejay Gigolo, Lone Records or even Dominance Electricity, the German electro group, widely influenced by West Cost 80′ electro funk, announces the coming of his first album in 2006 and delivers already its fourth EP, on Larry McCormick’s Monotone U.S.A imprint (Psi49net, Datapunk, Psi City). No need to say how much this output is vital! On A side, “Robotmachine” (declined in original version, then divided in separated parts to mix on “Robotsequence”) introduces an ultra heavy beat relayed by industrial distortions, a Dynamix II or Egytpian Lover style vocoder and almost all this nostalgic touch that is the trademark of the trio. Unique. “Electronic Freakazoidz” on the flip goes on in a less rough register, offering a heading and minimal cut to bring closer to “Frequencies”, published in 1998. At last, absolute climax and probably the best construction of the 12”, “Autobass” serves a superb old school electro funk anthem full of references (Kraftwerk, Cybotron…) and accompanied by hallucinating lyrics. A delightful and melodic jewel that lets foresee future devastating pieces. Fantastic!! © 2019 Dynamik Bass System – The Mighty Machine All Rights Reserved.